Posted by Bill Sandweg on 14 January 2019. When you go to today’s hospital, you are entering a large, complex system where there are lots of communicable diseases and lots of opportunities for those diseases to be transmitted to you. There is even a special name for it: Hospital Acquired Infection. If you weren’t that sick when you got there, you just may be after staying a few days. Here are just some of the risks you face in a modern hospital. Evolution is alive and well in hospitals. Bacteria, which could have been knocked out easily with just a shot of penicillin seventy-five years ago have evolved to become resistant to even the latest wonder drugs. Much of the development of antibiotic resistance has been attributed to overprescribing of antibiotics in the past. According to the Centers for Disease Control, there are at least six superbugs thriving in hospitals today. They include Carbapenem-resistant Enterobacteriaceae (CRE), Methicillin-resistant Staphylococcus aureus (MRSA), ESBL-producing Enterobacteriaceae (extended-spectrum β-lactamases), Vancomycin-resistant Enterococcus (VRE), Multidrug-resistant Pseudomonas aeruginosa, and Multidrug-resistant Acinetobacter. Each of these is capable of killing a person. For some of them we still have one or two drugs that can treat them but, if past history is any guide, the superbugs will soon develop a resistance to them as well. This is an arms race with bacteria that we are unlikely to win. There are so many of them and so few of us. The best solution is to keep patients from getting an infection in the first place. This is easier said than done. One thing is recognized as true: Doctors must exercise more discipline in prescribing antibiotics and make sure their patients know how to use them when they are prescribed. It is important for hospitals to prevent the spread of infections by isolating patients. If a patient has a highly infectious disease, that patient should not be in a room with other patients. Patients who are particularly susceptible to infections, such as older patients or patients who are immunocompromised, should not be exposed to others who have communicable diseases. Unfortunately, hospitals are run by human beings and are imperfect institutions just as are all other human endeavors. Mistakes can and will be made. We just have to hope those mistakes don’t kill people. It is no secret that doctors, nurses and other health care workers at hospitals spread bacteria from one patient to another on a daily basis. Doctors’ ties are a well-recognized home for many bad bugs. The doctor goes from room to room and from patient to patient wearing the same tie and it is rarely, if ever, disinfected. For that reason, some hospitals have told doctors to get rid of the ties. Hands that have touched a sick patient should never touch another patient without being thoroughly washed. This has been recognized since at least the time of Louis Pasteur but is still a problem. 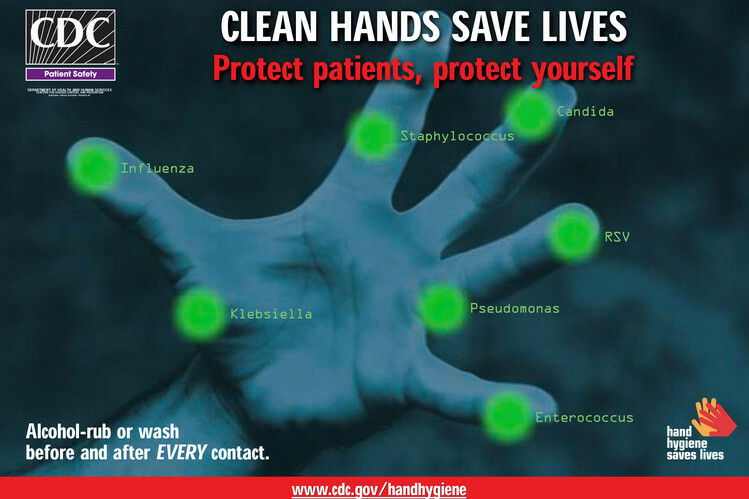 There is not a hospital in the United States that does not require thorough washing after coming into contact with a patient and before coming into contact with the next patient but doctors and nurses continue to skip the hand washing from time to time. Rules and reminders are apparently no match for human nature and the temptation to skip a step now and then. Don’t let anyone touch you unless they tell you they have washed their hands. When you or a loved one are in the hospital, watch for proper hygiene and ask that you not be exposed to other patients who may make you sicker than you already are. Good luck.